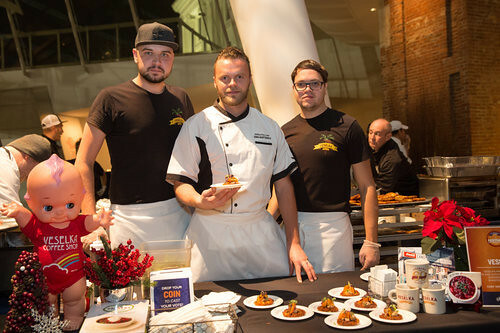 Earlier in December my husband and I joined the 8th Annual Latke Festival, a large tasting event dedicated to celebrating the best latkes and creative interpretations of a potato pancake in New York City. This year it was held at the Brooklyn Museum. It was nice to leave the borough of Manhattan for a while and visit Brooklyn for this festival. Honestly? I always had a weird thing about potato pancakes. When I was a kid, I had some REALLY bad ones and I have not really enjoyed them since. You are probably wondering why I would attend a latke festival if I don’t like potato pancakes. Well, it is simple really. I have a rule of trying something at least 3 times before I call it quits and since I have not tried potato pancakes since, I still had two times to go. This time won me over – or, should I say, Shelsky’s of Brooklyn won me over. 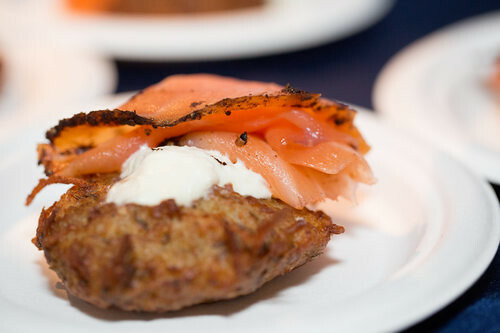 I simply LOOOOVED their latke with honey mustard, caraway seeds, sour cream and gravlax and lots of it. It was not a surprise that they won the people’s choice and came in second with the judges. 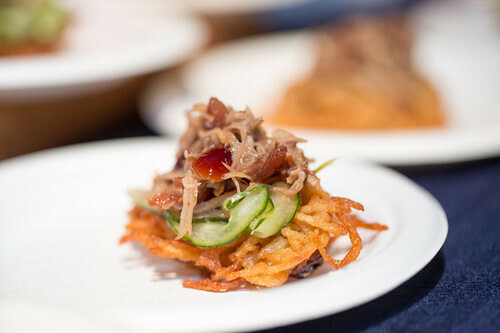 I had a duck confit latke made by Benchmark first, which I also loved. It was delicious and a complete combo surprise that just made me think comfort food instantly. 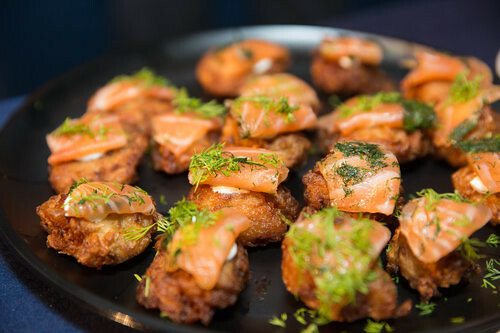 I tasted every single latke that was offered that evening and I must admit, I went between the Duck Confit Latke and the Latke with Gravlax the entire evening. They were so yummy. 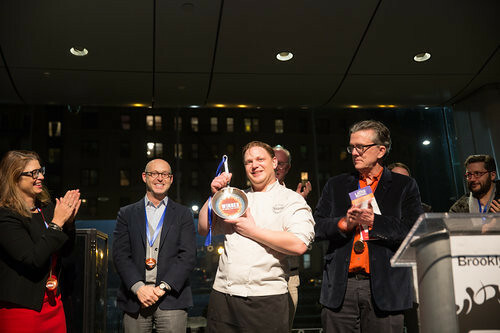 The Benchmark latke was elected the winner by the judges. 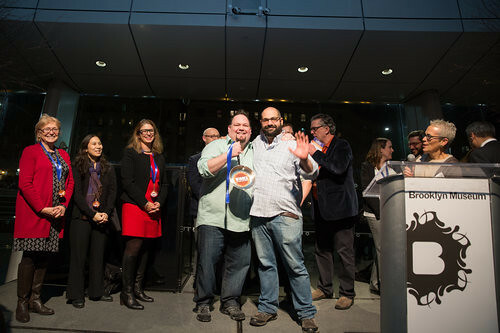 The judges consisted of Alicia Glen, the Deputy Mayor of New York; Angela Moore of the Food Network; Arthur Bovino from mouth.com; Bret Thorn from Nation’s Restaurant News; Channaly Philipp from Epoch Taste; David Berliner of the Brooklyn Museum; Jake Dell of Katz’s Delicatessen; Kurt Anderson, novelist and host of Studio 360; Linda Laviolette, NYS Department of Agriculture and Markets; and Ralph Gardner Jr from the Wall Street Journal. 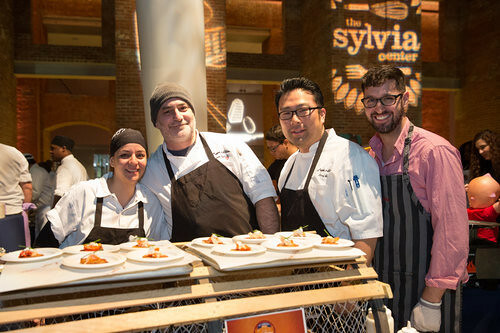 Proceeds from ticket sales went towards The Sylvia Center. 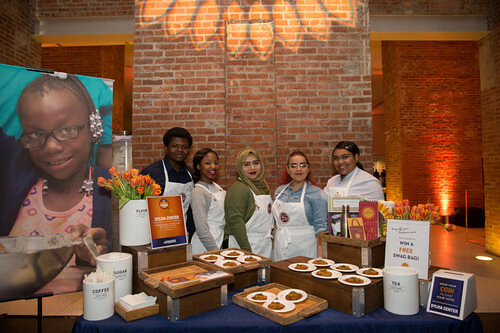 The Sylvia Center is a 501(c)3 nonprofit organization that addresses the growing epidemic of childhood obesity and diet-related diseases by inspiring children, teens and families to eat well through hands-on experiences on the farm and in the kitchen. I therefore urge you to attend next year! Not only will you support an amazing organization but have a fabulous evening with amazing food and lots and lots of drinks. Bring your friends and make a night of it!